Mao Dun (1896 AD - 1981 AD) was one of the great literary figures of post-Revolutionary China. He was a writer, literary and cultural critic of the New China and New Realist tradition and also could be regarded as a journalist. Becoming one of few great names of the new Chinese literary movement of the 20th century, Mao Dun produced masterworks titles such as Rainbow, Midnight and Silk Worms, which all are now famous novels representative of what has been called the Realist Tradition of modern Chinese Literature. As did other great writers of this essential movement such Lu Xun himself, Mao Dun also translated a number of Foreign Language works into Chinese, at the time with the aim of informing the masses if ignorant Chinese and infuse them with modern tools with which to take on the challenge of modernizing China through what no doubt would be a lengthy revolution. Mao Dun is also known to have been active in a number of Literary activities. In 1920 he helped found the Literary Study Society, an association promoting literary realism. In the same year Mao Dun was also responsible for translating the 1917 AD Constitution of the Russian Soviet Republic into the Chinese language, an act which then helped in establishment of the Communist Party of China in Shanghai in 1921 AD by providing a model for that new Party. Apart from providing the constitution to found the party, Mao Dun was also the first already established leftist Chinese writer to join the Communist Party of China, as he did so when it was founded. Only after this turbulent period of political involvement Mao Dun wrote his greatest literary works, the first being Huanmie (1927), the first of three piece novel being published in 1927 AD (the second and third volumes Dongyao and Zhuiqiu were published in 1928). In the same year, he published his first famous novel, known as Disillusion (幻滅). Other works such as Hong came in 1929 and in 1933 Midnight (子夜), a novel hailed as a milestone in Chinese modern literature and generally held to be a naturalistic novel exploring the commercial world of Shanghai in detail, became the final masterpiece. Thus, apart for being famous for his great work as a writer, Mao Dun is also noted for his lifelong involvement in political activities. His most notable deeds where his involvement in the May the 4Th 1919 Movement, the founding of the Communist Party of China in Shanghai in 1921 AD, and the joining with the so called northern expedition under the united front of the leading Kuomindang Party in 1928 AD. After a flight from political persecution to end up in Japan, Mao Dun joined the League of Left Wing Writers in 1930's again following a path that was intertwined with the ultimate national fate of the Communist Party of China. As a staunch loyalist, great example and member of the old guard generation of Revolutionaries Mao Dun was greatly appreciated. In later life, many years after publishing his greatest literary works, he thus became the secretary and later Minister of Culture under the first Government of the Peoples Republic of China run by Mao Zedong retiring only as late as the year 1964, due to political problems. 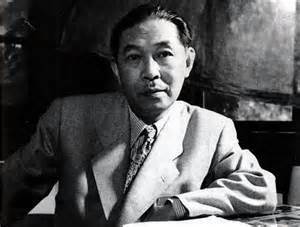 In that same era he was also several times in succession the Chairman of the Chinese Writers association. It appears Mao Dun remained inactive and out of sight as well as he could during the years of the Cultural Revolution (1966 AD - 1976 AD) which he survived. Mao Dun lived for another five years after Mao Zedong's death. During the last few years of his life, Mao Dun lived in this modest but spacious courtyard home where although plagued by intense pains, he returned to writing, working on what was to become his memoirs to be published under the title: "The Road I Walked (我走過的路)". The work was never completed. He lived in this residence between the years 1974 AD and 1981 when he died of illness in a hospital elsewhere in Beijing. An older pre-Olympic reconstruction Era Map of DongCheng District with Location of Mao Dun Residence Museum and surrounding Hutong. Click Map to go to Full Version. Mao Dun was not native to Beijing but was a man who originated in a town known as Dongxiang (or Tongxiang) in Zhejiang Province in south eastern China. As with his acclaimed colleague Lu Xun, and other scholars such as Chen Duxiu, Cai Yuanpei, Li Dazhao, Zhou Zuoren, and Hu Shihhe derived from what could be ragarded as a fairly well off family aristocratic family. His parents were literate and his father even established the classical curriculum that was taught to him in his youth. In the case, not a rented local Scholar of name but his mother was his first teacher, something which was frequently done in aristocratic families. Although not having taken this name then yet, Mao Dun started testing and developing his literary skills at a very early age. Already when in primary school he is supposed to have shown special skills in the field. Later Mao Dun ended up going through secondary school in the great city of Hangzhou, the Capital of his native Zhejiang Province famous for its prozaic West Lake. It is in Hangzhou where he had the time to engage in extensive reading and even strict writing skills training. According to himself and other sources it was in Hangzhou where Mao Dun finished reading Selections of Refined Literature (《昭明文選》), Shi Shuo Xin Yu (《世說新語》) and a large number of other classical novels which together all ended up influenced his mind allowing him for the creation of his distinct writing style and the specific subject ideas for his own novels. Mao Dun lived in the city of Beijing for the first time in the years between 1913 AD and 1916 AD, when he entered the three-year foundation school which was being offered by Peking University, perhaps the most prestigious University in the Nation at the time. Apart from that, it was also the most revolutionary University in China at that time. It is recorded that after nearly 3 years in the Peking University Mao Dun had to leave the establishment ostensably due to a lack of funds to keep on to the end. In this 3 year time period however he could study both Chinese and Western Literature. The period also allowed to become aquainted with several others persona who shared with him idea's that would later on become essential ingredients of the building of a new Chinese State. Under the guidance of the Dean of peking University, Chen Duxiu and its Librarian, the now equally legendary Li Dazhao radical new thinkers were attracted to this group. During his time at Peking University Mao Dun ultimately became embroiled with the political activities of this group, performing a few feats that would put him forthright on the march towards revolution, and not much later marxism and socialism. The former residence where Chinese Literary Hero Mao Dun spent the last years of his surprisingly long life can be found not too far from the Drum Tower of the city. 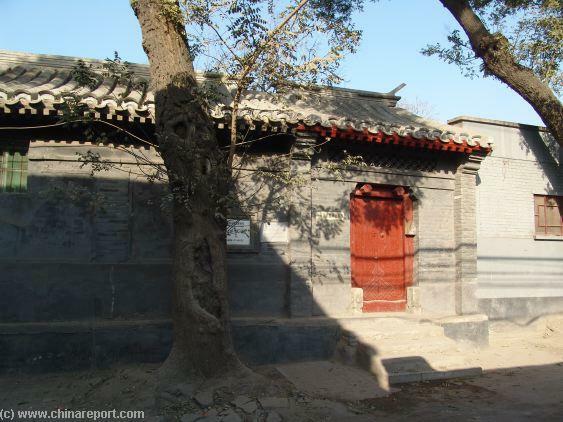 In fact, it is situated at only 2 hutong distance south of Drum Tower East Street (Gulou Dong Dajie) with the address of No.13 Houyuan'Ensi (near Annei Dajie'), in the area south west of Jiadokou Road, in the Dongcheng District of Beijing. Although these sound like very clear directions, in reality today this is still a rather off the beaten path location deep hidden within a hutong area. No additional historic landmarks, certainly not one of the more grandiose, can be found in the immediate vicinity, so when planning your visit be sure to navigate well and be attentive to your surroundings. The Mao Dun museum is but a small courtyard with its door along the northern end of Houyuan'Ensi Hutong. It is part of the western section of this hutong lane. On its east side the Mao Dun Former Residence is flanked by several much larger compounds which also have their own walled gardens. Please refer to adjacent map for precise location. Over the course of its long history the city of Beijing has been the home of many intriguing and otherwise famous or notorious people involved in the making of National history. Although in the past 14 or more years the city has seen a spectacular upheaval of ongoing construction, reconstruction and development, the old city (the area within the old city walls) does have many protected relics of which the Mao Dun Residence Museum is one. Under the protected relics in this area of the Dongcheng District there are 13 such former residences, of whom only two are registered as a state level protected relic and the others merely as city level protected relics. Of these two most important relics of State Level protection Mao Dun former residence is one, the other being the first ever residence of Mao Zedong in Beijing, hidden away in another Hutong in the area north east of the Bell Tower of the Old City. Opening Hours are: Tuesday,Thursday,Saturday from 9am - 4pm all year around. The courtyard itself lies in a fairly calm space away from the much larger and busier Annei Dajie (Street) nearby. Mao Dun (Shen Dehong) spent the last 8 years of his Life living in what was at the time a large Quadrangle Courtyard House in Beijing. The Residence has 20 rooms and two courtyard, one is the front courtyard and a larger Central courtyard. Having found himself without funding in 1916 AD and forced to leave the prestigious Peking University, Mao Dun came with the recommendations of Dean Chen Duxiu and so had been offered a place at Shanghai Branch of the Commercial Press (商務印書館) where he did the English editing and translation sections of certain sections. At the same Mao Dun embarked on a career of literary criticism writing several important editorials in the years 1917 AD and 1918 AD. the wife of the beloved former Prime Minister of the Era Zhou Enlai, the nearly equally beloved Deng Yingchao. It says: "Mao Dun Gu Ju," or "the Former Residence of Mao Dun." In 1986 AD a half-lenghth white marble statue of Mao Dun was erected in the front courtyard. The houses surrounding this front courtyard are kept as they were intended, fuctioning as sitting rooms and libraries. There are also two rooms used to display Mao's biography and some 400 mementos, including his manuscripts, letters, and literature periodicals. The next court which is in effect the central courtyard of the complex. As was the norm in traditional Beijing, the courtyards are decorated with trees, and it was at the central courtyard where Mao Dun cultivated his grapevines. These can still be found in the court, creeping along trellis of which it is said that Mao Dun used to hang a swing on. The swing was for his granddaughter, with whom he spent many hours among the grapevines. Two old cypress trees guard over the peacefulness of the house. Today, the last and northernmost courtyard is held to be the most well preserved keeping the objects of the life of the master as much as they were in his last few days in 1981. The contents of the halls remain in their original state. In the sitting room rows of bookshelves are preserved as they were when Mao Dun used them. The book cabinet in the living room holds his literary works, including editions translated in various languages. In front of the book cabinet is a pair of folding chairs. Mao used to sit in the one on the left to meet with Chinese and overseas friends. In the same room Mao Dun's large desk set against the window still holds the calendar which marks the day February 19 of 1981, which was his last day of health. The very next day Mao Dun was hospitalized, never to return to his Beijing home again. A few years before his death all of the proceeds from Mao Dun's works, some 250 thousand yuan (at the time some 30 thousand US dollars) were deposited to set up the Mao Dun Literary Award, now a National Standard. Party in 1921. In the first period after the establishment of this party, being a founding member, he worked as a liaison for the party. He also wrote for the party magazine 'The Communist Party' (共产党). The texts that are now considered the greatest literary works of Mao Dun were all written in the later part of the 1920's and the first part of the 1930's, a period when contemporaries such as Lao She, Lu Xun and Bing Xin also published their greatest works. With parts of them first published through the works of such leading literary magazine New Youth, they all became examplaries of the New Culture literary movement. In the meantime, however Mao Dun was not merely a writer but was also quite active as a revolutionary troublemaker. That is, in the years between 1926 AD and 1928 AD, right up to the moment of the great white terror of the Kuomintang inflicted upon the communist radicals, Mao Dun is reported to participated in Chiang Kai-shek's Northern Expedition. SHI, a Novel which is considered as Mao Dun's first work, consist of three slim volumes, HUANMIE (1927), DONGYAO (1928), and ZHUIQUI (1928). It portrays a generation of young intellectuals, who are caught up in the tidal wave of revolutionary fervor without a true understanding of the the nature of social change. Mao Dun saw his final novel Midnight, a masterpiece involving over 70 characters, published in 1933 AD. Mao Dun did write various texts thereafter, but never published a novel again. His supposed last work, his autobiography known as "The Road I Walked (我走過的路)" could not be completed. Having a completed his greatest Novels and Novella's by 1933, the accent of Mao Dun's career seems to have veered back to the political activities he had become familiar with in his early years a student in Beijing and after his move to Shanghai. When in 1937 AD the Japanese military launched a full scale invasion of both North China and South China, Mao Dun is said to have been actively involved the resistance against this armed invasion. After this first initiation of the Sino-Japanese War War in 1937, Mao then fled before Japanese forces traveling through many places in the Chinese hinterland before starting a literary magazine in the old city of Wuhan along the Yangtze River. Regardless the dangers, he again survived and later on, he also edited the periodical Literary Front and the literary page of the newspaper Libao in Hong Kong and worked as a teacher. Instead of continuing to deliver social criticism so easily associated with the New Cultural Movement, the decade of the 1940's shows an older Mao Dun differently interacting with his world. In a literary sense, the period only leaves us one novel, 《獻給詩人節》 Xian Gei Shi Ren Jie [Giving to the poet festival] (1946) and a few Political Essays, written after Mao Dun has spent some time visiting the Stalinist Soviet Union in 1946, a trip no doubt arranged with the fullest support of the high ranking in the Chinese Communist Party. By that time, the young revolutionary writer had become an experienced older player, well in touch with the view and expectations of the politicians who his generation had helped bring to power. The two essays are 《蘇聯見聞錄》 Su Lian Jian Wen Lu [Traveling Diary of USSR] published in 1948, and 《雜談蘇聯》 Ji Tan Su Lian [Talks on USSR] which was published a year later in 1949. Apart from these writing activities Mao Dun also engaged in the translation of Drama, focusing with the importation of the Modern drama "Russian Question"(話劇《俄羅斯問題》) (1946) and the Novelette "Group's Sons") (1946) on Marxist socialist themes. 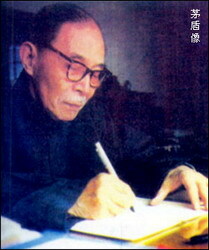 A Photo of Mao Dun the writer during his later years. A Photo of Mao Dun in Shanghai in the 1930s. If it was a rationalists set up, or just plain coincidence is hard to tell, but Mao Dun's staunchly loyalist proponency of Marxist Leninist theory, socialism and the providing of examples of class struggles, Nationalism and anti Japanese resistance made him exactly the kind of model writer who could serve well as an intellectual involved with the management of Culture in the new Government planned be set up as soon as the Chinese Communist Party could proclaim its victory and the unification of the larger nation. After working a brief stint as Mao Zedong's personal Secretary, which allowed him to build a lasting understanding with the old dictator, he was promoted onward to function as the Minister of Culture of the Peoples Republic of China. Regardless of the rise and fall of other great veterans of the Communist Party and its many interior struggles, Mao Dun remained in function as the Minister of Culture until the year 1964. Having fallen to the initial political strife that would preclude the great climax of the Cultural Revolution unleashed on the Cultural Sector and intellectuals such as himself in the year 1966, Mao Dun could consider himself lucky enough to walk away from his fall rather unscathed, surviving most of the period of the Cultural Revolution in safe obscurity. In the year 1976 when the death of Mao Zedong ended the madness of the Cultural Revolution Mao Dun seems to have reappeared, although an intellectual, also a loyalist, founding father of the party and thus rehabilitated. A true veteran could claim certain privileges and among the perks given were the chance to live at this address at Houyuan'Ensi, which was considered a worthy address for the old master to complete his last works in peace. In 1986, five years after his death, the name of Mao Dun still earned enough respect within the founding tales of the Communist Party for him to be given the honor of having his 90th birthday remembered through the publishing of official state sponsored China Postal Service Stamps. In 1915 AD, while Mao Dun was a student at Peking University, its Dean Chen Duxiu started the publication of magazine named New Youth, a now historic famous literary magazine which in due time would end up being the most important mounthpiece and proponent of writers of the so called New Cultural Movement. It published an article written by Mao Zedong, who was then still in Changsha, for the first time in 1917 AD. Originally then still known as Shen Dehong (also known by the alias Shen Yanbing) he started his writing career in the year 1916 AD, while still in Beijing, adopting in the process the writing name of Mao Dun. According to himself eventually he adopted the name 'Mao Dun' (矛盾), meaning "contradiction" which was to express the tensions his generation of writers felt between the utopian thoughts of national renewal, and the suffocating realities of the broken Nation of the 1920s in China, the various conflicting political ideologies available from the west amid the literary attempts to change life for the better in an overpopulated and under educated Nation. In the meantime, although having left school without the desired diploma, Mao Duns unusual education, his special literary talents and wide knowledge of both classical Chinese and modern Foreign Literature allowed him to persue both a carreer in the literary world as well as one as journalist. Starting due East of Jingshan Park at the corner and Moat of the Forbidden City, the WuSi Jie', Avenue of the May the 4Th Movement stretches Eastward to the China National Art Gallery and Museum. Along its northern length - the small but noteworthy and honored Monument to the Movement of May the 4Th 1919 Ad, when Beijing Students ignited a Nationalist Strife in defense of China and the Chinese Culture. Head North from Beijing's landmark Bell-Tower and dwell into the Hutong to find one of Beijing's lesser but most significant landmarks, one of the early residences of "Chairman" Mao Zedong himself ! Find the House where Mao lived in 1919 AD with his Teacher and Mentor and head down Beancurd Pond Lane to follow on the Path of the Chinese Revolution. Mao's true socialist education began here, in Beijing and at nearby peking University. A Related site is the first former Residence of Mao Zedong, at which address he lived after having moved to Beijing under the patronage of Yang Changji who had been offered a job at Peking University. Arriving but a few years after Mao Dun had left, Mao Zedong became involved with the same old guard revolutionary teachers, namingly Chen Duxiu and more closely Li Dazhao who would become his direct superior at his job in the Library of Peking University. While still a bachelor, Mao Resided in a cramped and filthy room together with other students in a hutong near the Bell Tower of the Old City. Later, after court Professor Yang's daughter succesfully, he lived in better quarters which are also preserved today and can be found in the Caishikou hutong area of Xuanwu District, at only a few alley's distance from the Buddhist Source of the Law Temple and Monastery (Fayuan Si) one of the oldest temples in Beijing. This site is refered to as the Mao Zedong Former Residence at Caishikou. went on to help found the Chinese Communist Party in Shanghai in 1920. Due to its location which lies even today rather far away from any of the subway stations in the city, and the lack of obvious (famous) landmarks anywhere in the vicinity, actually making your way to its front gate is rather more easily said then done. The easiest way to get there thus may be to just rent a taxi cab and have yourself delivered to as close to the gate as it can. When traveling by Taxi Cab, make sure you can communicate your correct destination to the driver, who is likely not to speak any English. So, for your own benefit. have the destination of Houyuan'Ensi Hutong memorized and if you can, make sure you are able to speak it. 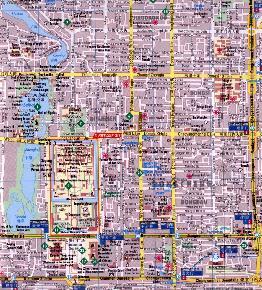 As a back up, you might also carry a map with you, on which the destination is visible is marked. This allows you to correct the driver, in case he suddenly becomes unsure of which hutong it was at again. Only allowing for the modes of transport getting to Mao Dun Former Residence Museum. means you will have to travel there by use of the subway and hike to Houyuan'Ensi Hutong from the nearest station. Making use of the subway currently allows for only two or three options. The subway station nearest to Mao Dun Residence is the Nanluogoxiang Station of Line 6. The two secondary options available both travel through Line 5, with Beixinqiao as the closest station to Mao Dun Residence although Zhangzizhonglu Station of Line 5 is also a walkable option only a hundred meters or so more in travel distance. The route from Nanluogoxiang Subway Station to Mao Dun Residence is as follows: Travel from Nanluogoxiang Station a short distance eastward along Dianmen Inner Street to get to the intersection of Dianmen East Street, Andingmen Inner Street and Zhangzizhong Road. From this intersection, follow Andingmen Inner Street nothward along its western (left) flank. The address is situated in the 7th Hutong to the north and left (west) of the intersection which goes by the name of Houyuan'Ensi Hutong. When following this route one enters Houyuan'Ensi Hutong from the east, which means that one has to walk more than half the length of this alley to get to the south gate of the courtyard house once inhabited by Mao Dun. The house stands along the north side of the alley facing the south and the sun. The directions for route through Beixinqiao are even more straight forward. The route also may be of equal length to the one through Nanluogoxiang. Once having arrived at Beixinqiao Station, get out through the south eastern exit which leads you directly onto Jiaodaokou Road. From the station, follow Jiaodaokou Road westward to its very end at the intersection with Andingmen Inner Street coming from the north and continuing on south. Across the intersection, the westward direction leads through Gulou (Drum Tower) East Street. At this point one can choose; either head directly south to find Houyuan'Ensi Hutong to be the second Hutong alley on the west flank of Andingmen Inner Street and then walk through to the other end, or take the other way around the block. To go the other way means continuing straight on into Gulou East Street, then turning south (left) into the first large alley, which is South Luogu Alley. Follow South Luogu Alley down south to find Houyuan'Ensi Hutong to be the 3rd hutong, turning off eastward (left when coming from the north) to lead to Mao Dun Residence.